Strong and qualitative water hose. Having a heavy duty water hose is an important thing especially when you have a big garden. Unique design that allows it to expand from a length of 15 to 50 ft. Never kinks or tangles after use. Easy to roll up and store. 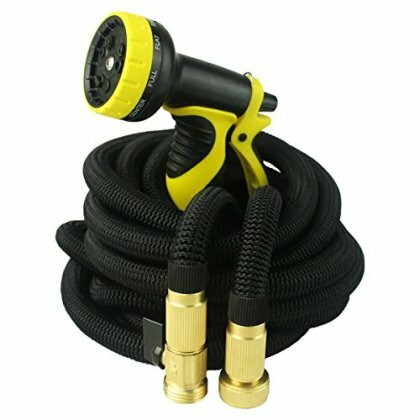 For your plants and flowers, the water is a vital thing, that's why a garden water hose like this one is an amazing investment. Quality and durable material. This hose is made to last for a long period of time and be your loyal help. 5000*5000D high-strength fabric and double layer latex core make it stronger, it will automatically last for a longer time than the usual ones. Brass fittings for a job well done: We are thinking about our client's needs and we want to offer you a quality product so you can be happy with your purchase and trust our brand. For the proper functioning of the product, this water hose has solid brass fittings and rubber washer that will prevent any leaks and cracks, not like other plastic fittings can cause. A versatile sprayer with 9 different spraying types. This versatile spray gun has 9 different type of nozzles that will offer you an adequate spraying type each time. Just by a spin of the nozzle and you can choose what kind of spraying do you need. Simple as that!